Nine months shy of hs 40th birthday, freelance music producer Tyler Harrison has started to experience horrific hallucinations. At first, he thinks it’s just the stress of his job, but the hallucinations continue until they culminate at the three-day concert in Chicago, Lollapalloza, which he is covering for work. There he is approached by an older man who tells him that he’s going to die on his fortieth birthday. The man claims to be an angel named Matthew, and even though he gives Tyler enough evidence to convince him he’s telling the truth, he doesn’t know what to do with the information. Tyler’s underlying doubt and confusion about Matthew’s prediction turn to anger, both at God and those around him. As he begins to exhibit destructive behavior, he befriends Ellis, an internationally known DJ. Tyler is scared that he really is about to die. He’s scared for his sanity. He’s scared that if he does die, he’s not going to Heaven. He also soon becomes scared of Ellis, who is wild and opens up a door of temptation to Tyler. 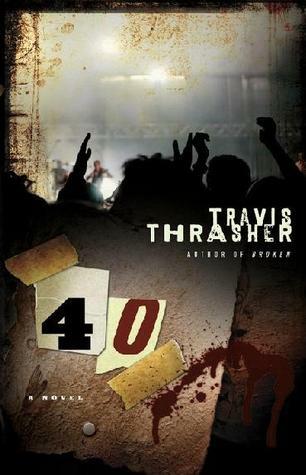 This was my first Thrasher novel and it was quite unlike any other novel I have read. The plot at first seemed a little– how to say it?– unoriginal, but Travis proved me totally wrong. This book has the creativeness, suspense and twists that makes me read suspense novels. Tyler was an amazing character with a solid back story that helped bring him to life. The first person point of view also helped with this. In my opinion, this story had to be written in the first person. It fit perfectly. Travis has an interesting writing style which I love. It has rhythm. This rhythm includes short paragraphs and sentences for the suspenseful parts and longer sentences for the clam(er) scenes. The only thing in this book that suspense readers may have with this novel is the language in it. Yes, it is a Christian book written by a Christian author, but there are a few curse words in here. Travis explained this in a podcast interview and I completely agree with him, so I don’t have a problem with it whatsoever. Even Christians swear sometimes, yes? I mean, we’re not all perfect, yes? And wuldn’t you swear if you were having hallucinations and being told how much time you have left to live? I am pretty sure most– most likely all of us– would. Compelling, suspenseful and filled with great characters, 40 is a novel you don’t want to miss! I received an advanced, reviewer copy of this novel for an honest review. All thoughts and opinions are mine.